It's rare to hear Congressional Democrats coming to the rescue of President George W. Bush. But a day after Venezuela's president called Mr. Bush a "devil" in front of the United Nations General Assembly, several prominent Bush critics are siding with the White House. Rep. Charles Rangel – the Democrat who represents the New York City neighborhood that Hugo Chavez visited Thursday – took a swipe at the Venezuelan President for his behavior at the U.N.
Rangel said he wants to make it clear to the Venezuelan President that his comments on Wednesday were inappropriate and the American people are offended by his criticism of President Bush. Speaking before the General Assembly's annual meeting of world leaders on Wednesday, Chavez called Mr. Bush the "devil" and even said the podium that the President had used still smelled of "sulfur." Chavez received applause from the audience at the U.N. in New York after his remarks. Mr. Bush was not in the room at the time having already returned to Washington, D.C. after making his own speech to the General Assembly. This isn't the first time Chaves has taken verbal jabs at President Bush. 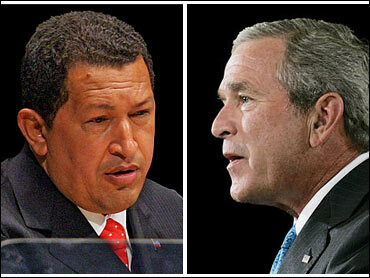 In a past appearance, Chavez said, "George W. Bush: You are a donkey, Mr. Bush." But none of his previous comments have been on as large a stage as the United Nations. Mr. Bush's predecessor, Bill Clinton, added his voice to chorus of Democrats condemning Chavez. Republicans on Capitol Hill got in on the act, too. House Majority Leader John Boehner released a statement bashing Chavez. "Hugo Chavez is little more than a power-hungry autocrat on an anti-American public relations tour -- a showboat whose speech to the United Nations was an embarrassment and an insult to the American people," the Ohio Republican said. The White House so far has refused to fire back at the Venezuelan leader. Secretary of State Condoleezza Rice said Chavez's comment "is not becoming a head of state." U.S. Ambassador to the U.N. John Bolton said the remarks "don't warrant a response." Bolton did add that, while Chavez has the right to express his opinion, it was "too bad the people of Venezuela don't have free speech." CBS News reporter Charles Wolfson, who covers the State Department, says the Venezuelan's comments are not that big a deal. Every leader gets his or her fifteen minutes in the spotlight – most use their time for standard policy statements which concern their countries, Wolfson reports. But there are always a few leaders who simply feel, either for nationalistic or individual pride, the urge to use their time to provoke, to use the U.N. podium as their personal platform to see and be seen as an actor on the world stage. But, CBS News Foreign Affairs Analyst Pamela Falk says Chavez could be setting himself up to be the chief thorn in America's side. "Venezuela's Hugo Chavez is rapidly becoming the new Fidel Castro, but with petro-dollars, at the U.N.," said Falk, "and as a candidate for a non-permanent seat on the Security Council in October, his anti-Bush comments are making him increasingly popular with member states in his campaign for that position." Chavez's personal criticisms of the American president were not slowed by the American officials' chidings. During his Thursday appearance in Harlem, he called Mr. Bush an "alcoholic and a sick man." Venezuela's president had just promised to double the amount of discounted heating oil his country is shipping to needy Americans when he fired the latest salvo. "Venezuela's generosity to the poor, however, should not be interpreted as license to attack President Bush. Those who take issue with Bush Administration policies have no right to attack him personally," said Rangel, adding that it was also "not helpful when President Bush referred to certain nations as an 'axis of evil'."